Scantlebury, touched by his early years in Barbados, not only brings vibrant colour to his canvas, but a sense of community, togetherness and lifestyle. 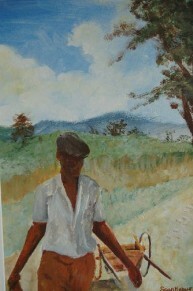 Inspired by the caribbean way, Scantlebury often paints the essence of a subject, inviting you to see the heart of the matter, rather than fine details. These paintings are NOT for Salee.